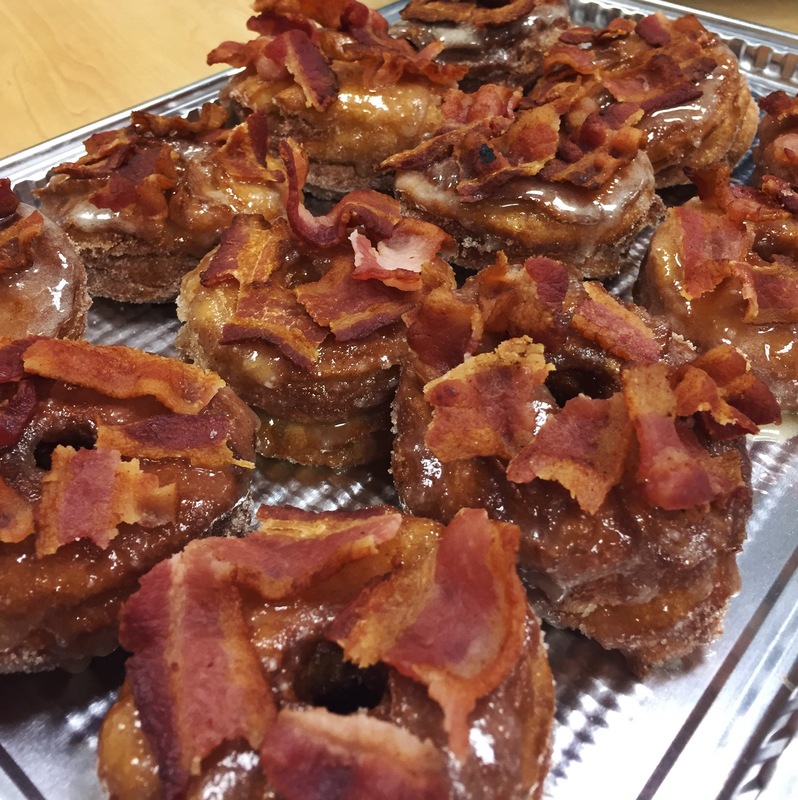 Pacific and June: Maple Bacon Doughsants: Or, I am not infringing on your trademark. Maple Bacon Doughsants: Or, I am not infringing on your trademark. Personally, I think that Tuesdays are highly underrated. The fact that they aren’t Monday makes them a pretty solid day of the week, so I move to celebrate their greatness by treating ourselves. How, you might ask? Three words: maple. bacon. doughssants. What is a doughssant? A doughnut made out of croissant dough. Sounds familiar, I know, but since ~certain people~ trademarked ~certain words~ to refer to this delicious specimen, we’re calling them doughssants. How could you possibly make these in a dorm? Actually, they aren’t that hard to make. I chose to make my own croissant dough, but modified it to be a little quicker/easier (ya, ya, I know you food purists are probably cringing and muttering about how it’s not true croissant dough. whatever). You can also take a shortcut by buying some frozen puff pastry from the grocery store and calling it a day. I made these for a sorority cook off event (which my sorority won btw) and they were SO good. Seriously, look at them. You want them, your friends want them, so let’s make Treat Yo’ Self Tuesday a thing and eat some maple bacon doughssants today. Happy cooking! **Update: The major has been declined. I've chosen Business & Spanish as less delicious alternatives. **Unfortunately I have to preface this by saying that we cannot be held responsible for any injuries incurred while making this recipe. Just don’t stick your hands in/near the hot oil, don’t touch hot pots, etc. and you should be fine. OR just buy pack (or a few) of frozen puff pastry. If you’re making your dough, scroll down for the recipe and start with that. Otherwise, thaw your store bought dough in the fridge the night before you want to make your doughssants! Now the fun part begins- put either vegetable or canola oil in a pot, making sure that you have plenty of empty space at the top (we don’t want splattering oil to cause burns). Place it over medium heat and start cutting out your doughnuts while it heats up. I used a water glass and a random little cupcake tool I have to cut the two circles out of my dough, but you can also just cut little squares/triangles/cookie cutters- just take what you have on hand and roll with it. After about 5 minutes, put a little piece of dough in the oil using a spoon or something that enables you to keep your hands FAR AWAY (seriously, don’t get burned by the oil. seriously. I’m being serious.) Once it starts to float/turn golden brown, take it out WITH THE SPOON OR SOMETHING and set it on a paper towel. That means the oil is ready, so you can start placing the dough cut outs into the oil one at a time, flipping every couple minutes until they’re golden brown all over. Use your judgment here- if they seem to be burning fast, turn the heat down. If they’re not cooking, turn it up. After they’re all beautiful and golden, remove them from the oil (I used chopsticks from the school convenience store) and drain on a paper towel or cooling rack, then repeat with the remaining dough. After a couple minutes, use chopsticks/tongs to put the doughssants in a bowl of cinnamon sugar, turning over until they’re completely coated. Allow them to cool. Once the doughssants are fried, coated in sugar, and set out to cool, take the oil off the heat and let it rest for a few hours until back at room temperature. Mix confectioner’s sugar, melted butter, maple syrup, and milk in a bowl using fork until smooth. This part is a matter of taste- I don’t like super sweet glaze, so I added a pinch of salt and did mostly grade A maple syrup and butter/milk. If you really like glaze, you might want to use more powdered sugar- totally up to you. Set your glaze aside and start frying up your bacon, making sure it’s extra extra crispy. Drain the strips on a paper towel and break them into smaller pieces once cool. Finally, assemble your doughssants! Dip the top of each in glaze then stick it in the pile of crumbly bacon bits, then allow them to set a little on a plate/cooling rack before serving. Or don’t and just eat them all while they’re still hot (which, tbh, is ideal). There you go! Maple bacon doughssants for purveyors of fine donuts. Enjoy! First, make the pastry dough. Put 1/2 cup milk and 1 cup water in a microwaveable bowl and zap it for 45 seconds-1 minute (or until pretty warm to the touch). Pour 1 tablespoon of dry active yeast over the mixture and let it sit for a few minutes. While that’s chilling, mix 4 cups flour, 1/3 cup sugar, 1 1/2 teaspoons salt, and 1 1/2 softened tablespoons butter in a mixing bowl/pot/whatever you can scrounge up. Add your milky/watery mixture to the dry ingredients and mix until combined (I used my hands, but you can use a spatula/mixer if you have one). Let the dough sit for about 30 minutes, then wrap it in plastic wrap and put it in the fridge. While it’s chilling (literally this time), squish 2 sticks of butter (1 cup) and form them into a square that’s about 6-8 inches on each side. You can put that back in the fridge for a while and let everything sit for about the amount of time it takes to watch an episode of Friends. Take your dough out of the fridge and roll it out into a big square- heavy glass bottles generally work well as rolling pins. Set the butter square on top and wrap it up with the dough, making sure to seal the edges. Roll the dough with the butter into a big rectangle, then fold in thirds. Pop that back in the fridge for another episode of Friends, then roll out and fold in thirds again. Now your dough is ready!